Salaudeen Rajack's experiences with SharePoint and its related products! How to Add a Farm Administrator in SharePoint? How to Delete a Site Collection? How to Change Site Collection URL? How to Uninstall SharePoint 2013? How to Reset Farm Pass Phrase? Search Scope Drop Down Missing? Quick Edit Disabled in SharePoint? SharePoint Keeps Asking for Password? Datasheet view in Read-only mode? Multiple File Upload, Explorer Views Disabled? Opening/Saving Documents is very Slow? Drag and Drop Upload Not Working? User Profile Synchronization Stuck at "Starting"
How to Use PowerShell with MOSS 2007? How to Delete a List using PowerShell? How to Add a Column to SharePoint List? Event Receivers vs Workflows - Which One to Use? SharePoint Vs Network File Share - Which is best? How to Use ULS Viewer for SharePoint Errors? How to Sync User Account Name Change? How to Create a Feature in SharePoint? Copy Webpart Pages between site coll. How to Add favicon to SharePoint Site? How to Create Image Maps in SharePoint? Change Site Logo using PowerShell? How to Make a Site Collection Read Only? How to Create a SlipStream Versions? 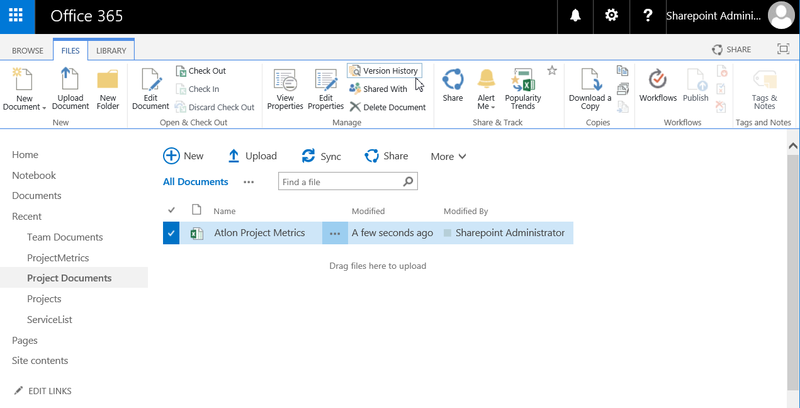 Versioning feature in SharePoint Online allows you to access previous copies of a document or list items. By default versioning is enabled on your SharePoint Online document libraries . When user makes edits, SharePoint automatically creates new version with metadata such as, Created by, Timestamps, etc. How to Delete Version History in SharePoint Online? 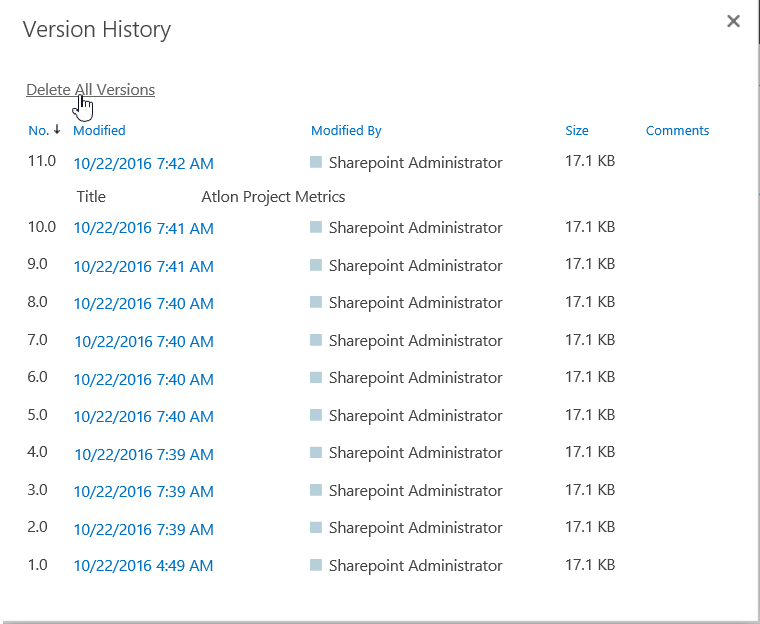 Navigate to your SharePoint Library, Select the file and then click on "Version History" from the ribbon menu. From the version history page, click on "Delete all versions" link, confirm if prompted! This PowerShell script deletes all versions in SharePoint Online. Add-Type -Path "C:\Program Files\Common Files\Microsoft Shared\Web Server Extensions\16\ISAPI\Microsoft.SharePoint.Client.dll"
Add-Type -Path "C:\Program Files\Common Files\Microsoft Shared\Web Server Extensions\16\ISAPI\Microsoft.SharePoint.Client.Runtime.dll"
Write-host -f Green "All versions Deleted for given File!" Write-host -f Yellow "Total Number of Versions Found in '$($Item.File.Name )' : $($Versions.count)"
These are really great and helpful scripts. I'm using the script to delete all but 5 versions for all files in a library, but the script fails if the library has any sub-folders. Any ideas what could be added so that the sub-folders are ignored? Thanks! Does Case 2 cover all files in all folders? and is it possible to have it filtered to limit rows to 5000 on large sites ? Script has been updated in CAML query to skip Folder objects. Try now! Salaudeen, Thanks for your quick. This is very helpful but I think many of us need help as our users keep adding files to multiple folders. Is possible to add a script targeting a specific folder and set it up as part of the variables. I believer We have admins here with multiple folders as me with more than 1000 items and set up to 2 or 3 versions that we are trying to keep "LEAN"........if Possible We will Appreciate the help. Can you please share the script to keep top 5 versions and delete all else, to run it in PowerShell usinf PnP ? Please Login and comment to get your questions answered! Salaudeen Rajack - SharePoint Architect - Primarily on Infrastructure, Operations, Administration and Architecture. SharePoint Keeps Asking for Password Everytime? How to Rename SharePoint Web Application Name and URL? This is my personal blog. Articles written on this blog are from my experience for my own reference and to help others. Do not reproduce my content anywhere, in any form without my permission. If any article written on this blog violates copyright, please contact me! If you have a more elegant solution on any of the topics discussed- please post a comment, I'll be happy to hear!